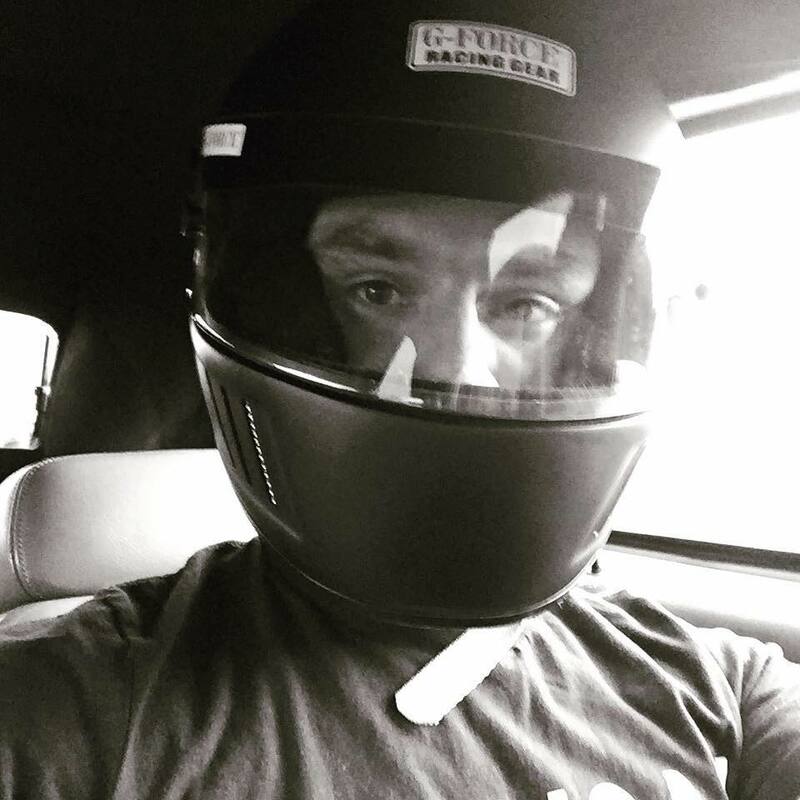 Now That The Mule Has Gotten Upgrades to Improve Handling, Braking, Appearance, and Utility, It’s Time for Bolt-On Horsepower! Originally intended for towing around the GM EFI project cars, The Mule has quickly nestled it’s way into our project car lineup itself. While it’s still a daily driver, parts hauler, and tow pig, it’s been getting a slew of upgrades lately to increase performance and utility. It’s just further proof that gearheads can’t just let a vehicle remain stock, but then again, why would you even want to? There’s so much choice when it comes to performance parts that choosing not to upgrade some elements seems silly. This platform is pretty amazing too, with its GEN-V 5.3L engine, plus it has 4-wheel drive. The 2016 Chevy Silverado is also a Z71 Rally Edition, which is an appearance package upgrade that gives it a mean, muscular look. Since joining the GM EFI family, it’s been track tested, received a set of Hellwig sway bars, a Brembo brake upgrade, XPEL protective film was applied, and right before this set of upgrades, a Chevrolet Performance cosmetic makeover. 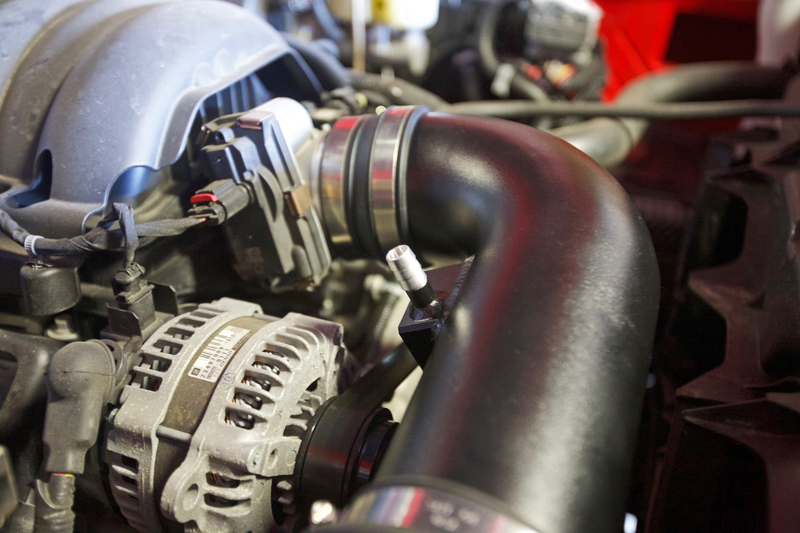 Starting with the intake, this upgrade is made to reduce air intake restriction by as much as 15-percent. 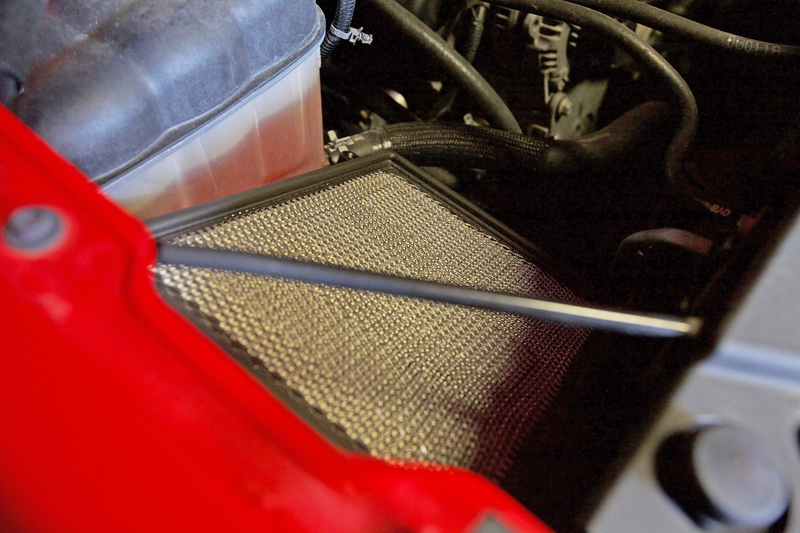 It’s not only made for better airflow, but it looks great in the engine bay. 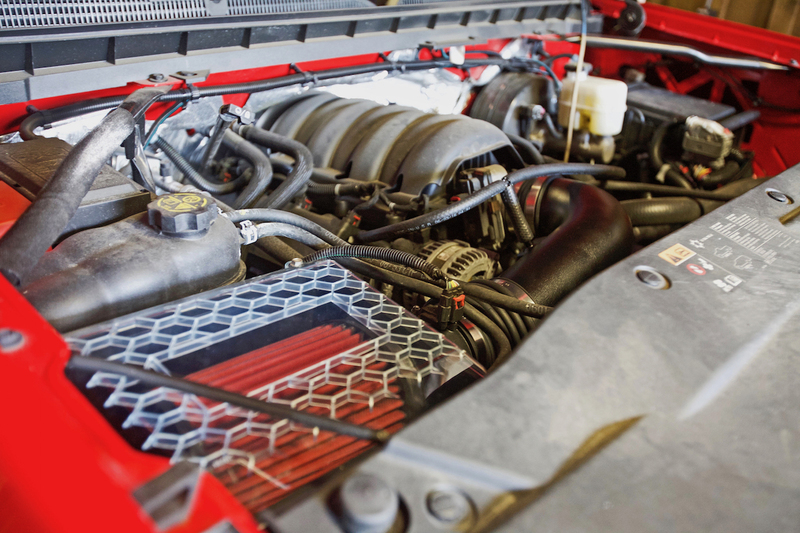 GM has spent a lot of time developing and testing these CAI systems to make sure they are durable, corrosion resistant, and offer a good performance upgrade. 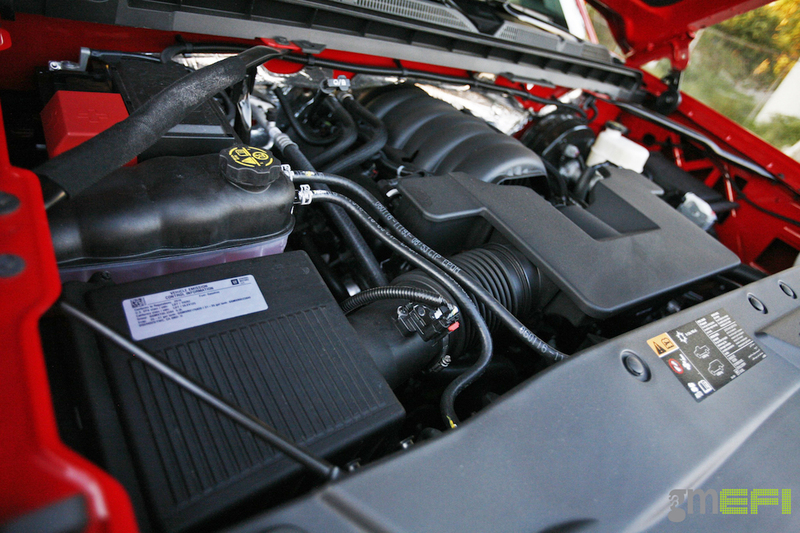 GM advises that you make sure the ignition is in the OFF and LOCK position, that all electrical loads are off, and the battery be disconnected before beginning the install to avoid personal injury, as well as damage to components during removal of the old air intake and installation of the new CAI. 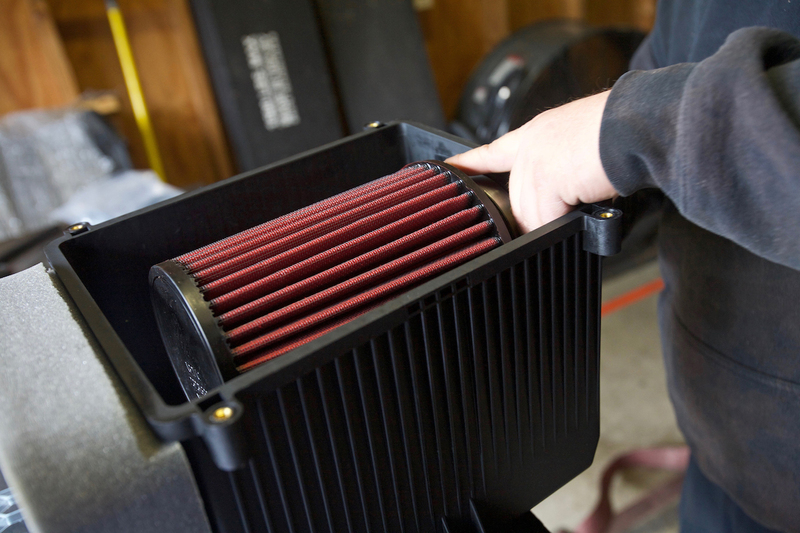 The factory plastics have to come off to access the air intake on the Silverado. 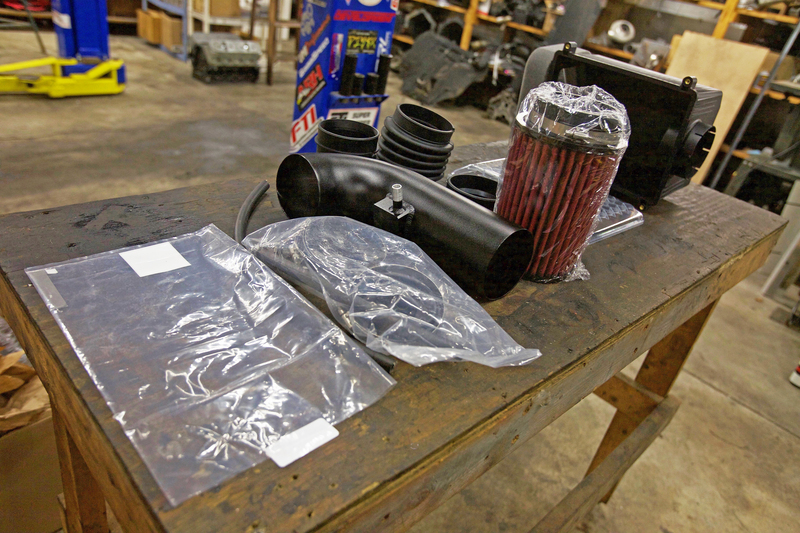 After removing these plastics, the next step is removing the production air cleaner outlet duct PCV lines from the valve cover and outlet tube. Now you will ready to remove the factory air cleaner duct by loosing the clamps on the duct and removing it from the throttle body. 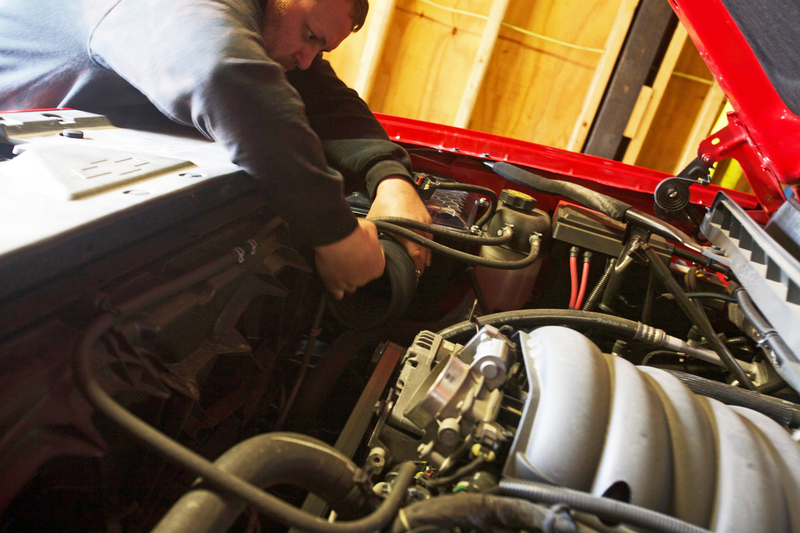 The mass airflow sensor (MAF) needs to be removed; take the MAF off by unscrewing the two screws, disconnect the electrical connection, and now you can put it off to the side, in a safe and clean area, until it’s time to reinstall it. Disconnect the MAF harness from the air cleaner housing, then pull upward in a jerking manner to disengage the air cleaner housing from the insulators. 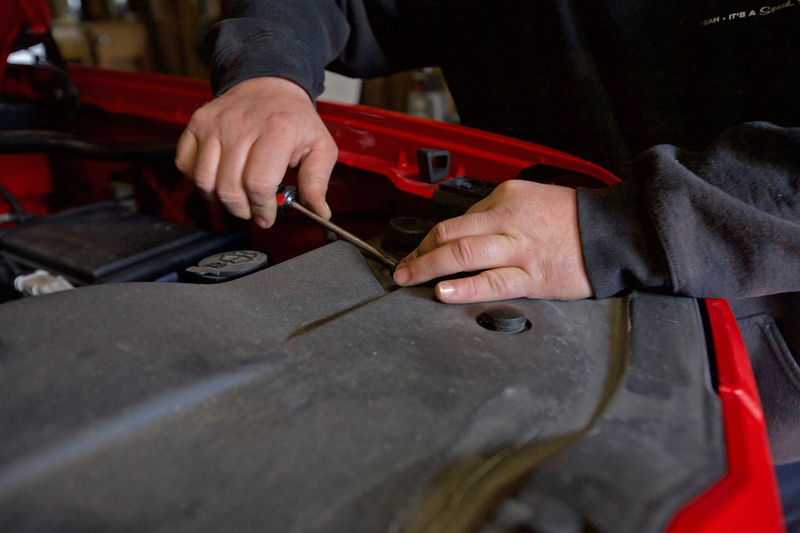 Remove the air box from the rubber insulators and out of the vehicle. Now that it’s all clear from the factor air intake, it’s time to put together the new intake for installation. You can choose to do this before removing the old cleaner, but it’s up to you. The directions say to place the box in the engine bay and then install the air filter element, but we put the box together before putting it all in the engine bay, it’s your preference. Install the MAF back on the box. 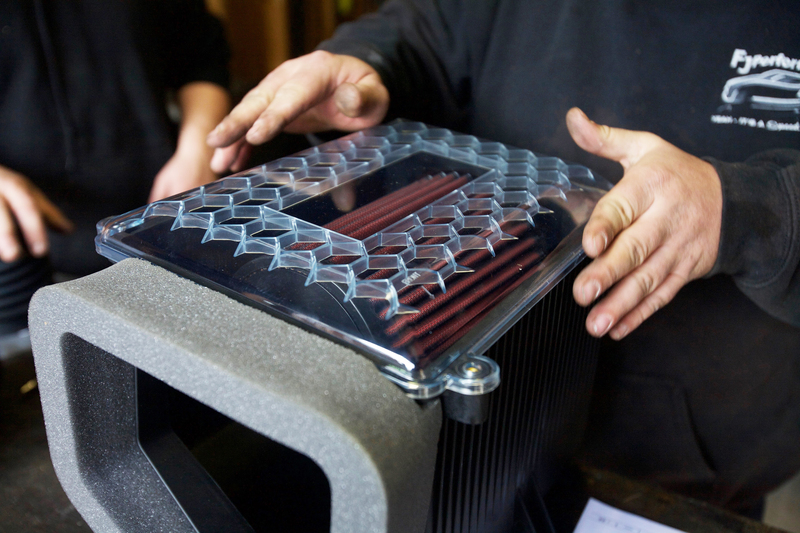 After installing the air element, the clear air box top goes on with four bolts that are torqued to 20.4 in-lb. Reconnect the MAF sensor, install the bellows on the MAF. Then install the new intake tube. After reconnecting the PCV system we’re done up top! 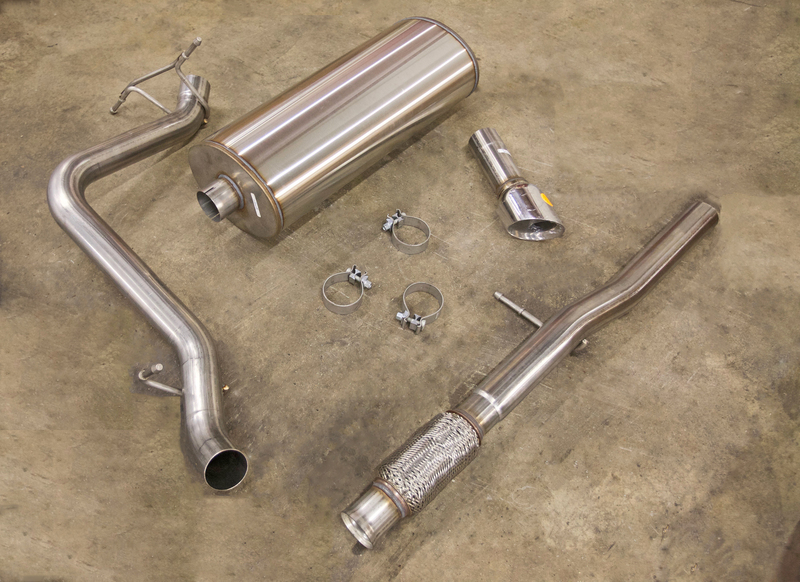 GM designed this system to increase the look, sound, and performance of the exhaust system. The whole system is constructed from 304 stainless steel. 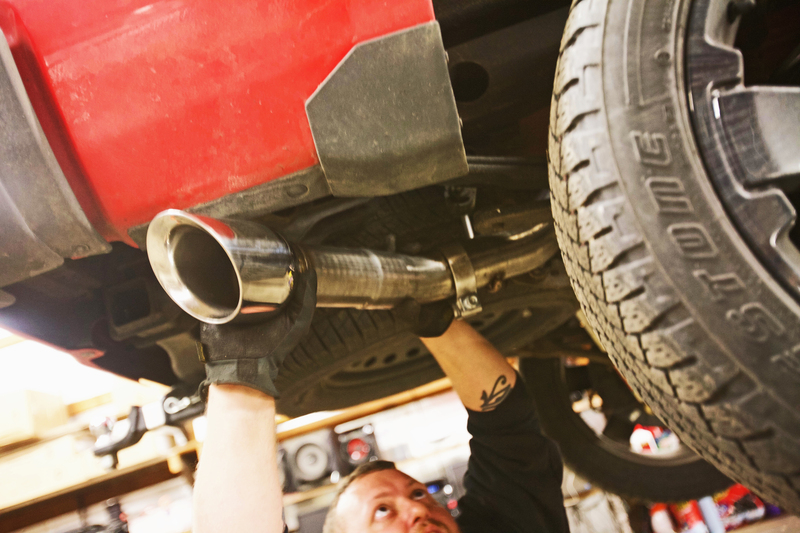 It has a 3-inch front pipe and tailpipe, with a highly polished 4.5-inch tip. Removal of the old system requires loosening the spherical clamp so the flanges can be separated. 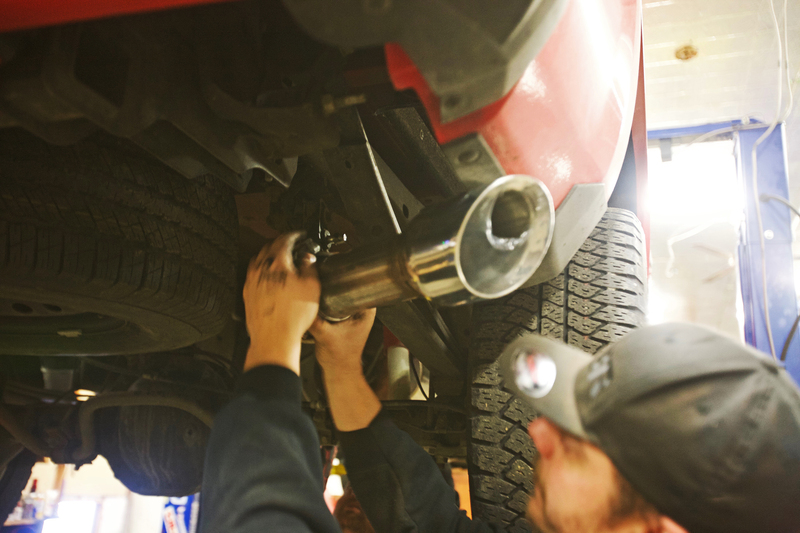 Remove the rubber isolators from the exhaust system and remove the factory cat-back by pulling it forward, while guiding the tailpipe over the axle. Now the new system is ready for installation by installing the front pipes onto the flange and hand tightening the clamp. Then, seat the hanger and pipe into the rubber grommet. Now it’s time to install the tailpipe over the axle and seat the tailpipe into the hangers at the front of the axle and one hanger in the rear. We’ve already installed the tailpipe with the clamp and aligned the clamp at the end of the expanded tube. Seating two of the clamps on the muffler at the pipes on the side where the muffler will be installed allows us to install the muffler and align it so the small hole in the end is facing down. After checking the system to make sure everything is bolted down, we’re ready to let The Mule down. So what did all this add up to? Well, for one, it’s easy to feel the difference in the pedal, and the sound is really improved. We took it straight to the dyno to check the numbers. Now before you wonder where the “big gains” are here, keep in mind that the Silverado has the Gen-V GM engine in it, which is controlled by a very prudish ECM. 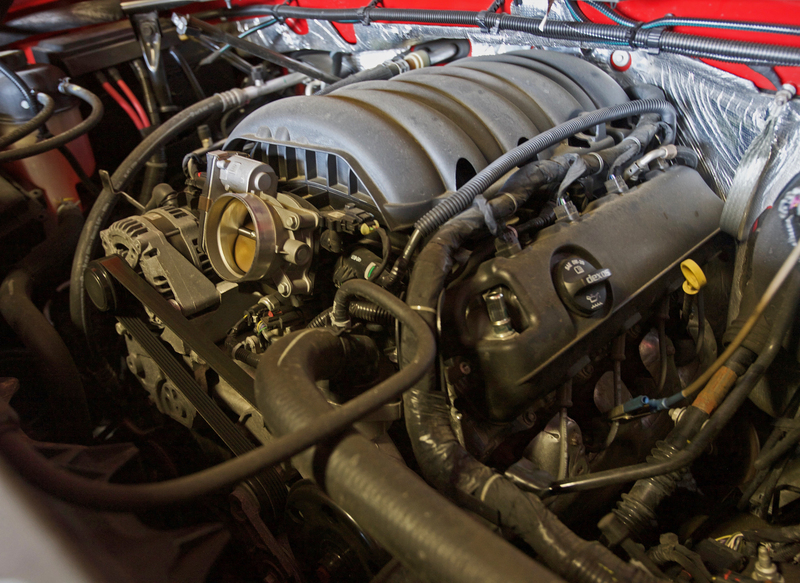 Nearly every change, especially with air or fuel, on the new GM engine platform requires tuning to make it run like it “should.” These engines aren’t like the old GEN-III LS, where you can simply bolt a part on and see substantial gains right away. 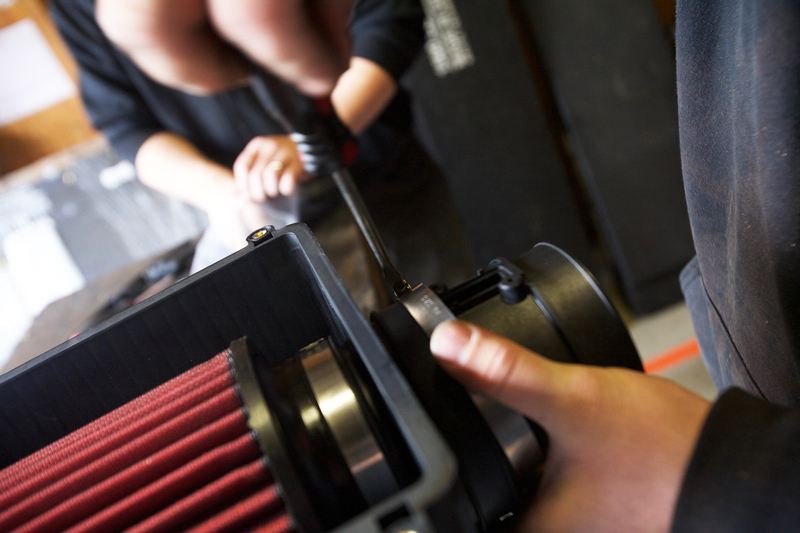 You’ll see slight changes in torque and power, and you’ll naturally see an improvement in soundtrack, but for optimum gains you’ll need to recalibrate your ECU. Also note that the CAI is a great supporting modifications on vehicles equipped with an aftermarket camshaft, heads, intake manifold, headers, and exhaust, but doesn’t necessarily reflect on the dyno when used on a stock vehicle. The Mule feels much stronger and more responsive than before. These projects took no time at all, and we’re very happy overall. 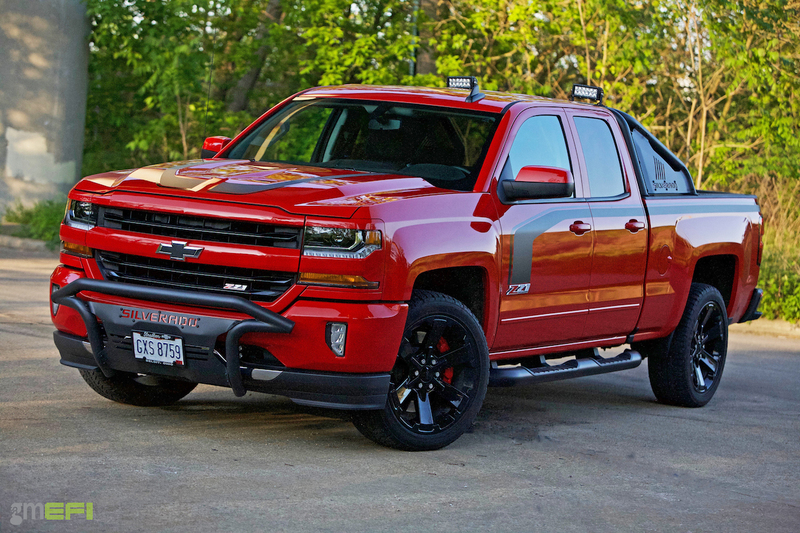 This is a great testament to using Chevy Performance Parts that are made by GM for the truck. Also note that these two upgrades are really going to shine during our next project on the Silverado, it’s getting a ProCharger! Stay tuned as The Mule really gets a performance makeover with a blower and tune, which could make it one of the faster project cars in the GM EFI garage! Thank you for the review! I was considering both of these; however, after seeing your dyno results I’m going to pass. It is a bit confusing. I’ve seen other CAI videos where 15+ HP was made without tuning (see Black Bear Performance as an example) and similar videos for cat back exhausts. Sounds like either their results were fabricated or the GM performance parts you tested are no better than stock. Though we didn’t see much in the way of peak gains on the dyno, there was a bit of a difference in the “seat of the pants” feel, as well as the soundtrack. We’ve done some testing with other products on very similar vehicles in the past, and saw very minimal gains without any form of tuning at all. 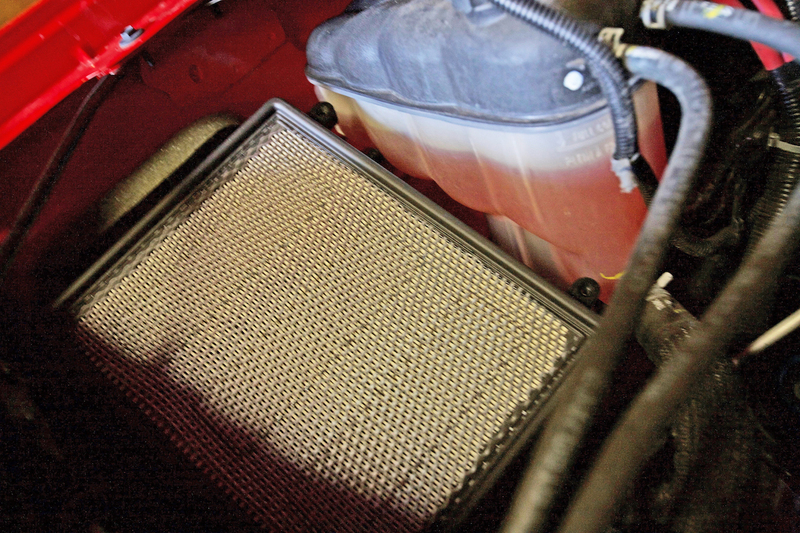 Again, without tuning, don’t expect much from a mere cat back and a CAI, on an EcoTec3 5.3L. By the way, we looked into Black Bear, and it seems that most of the testing that they do are on the older, LS-based trucks, and a LT-based 6.2L or two. Being a 5.3L, and being as how it’s already operating at a 65hp deficit from the 6.2L, it doesn’t shock us that they’ve seen higher numbers from CAI kits in their vehicles.